If you have Wi-Fi or internet connectivity on your iPhone it's pretty easy to install carrier unlock Ultrasn0w via Cydia on your device, however, things get complicated if you have no internet or Wi-Fi available on your iPhone leaving you with no choice but to install Ultrasn0w manually which require working with iPhone file-system and file-permissions. 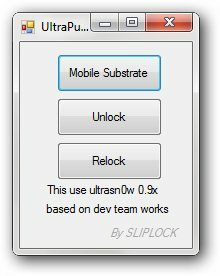 Thankfully, we do have a pretty much unknown utility 'UltraPusher' which lets users install MobileSubstrate and Ultrasn0w on their iPhone offline from any windows computer, all you need to do is to connect your phone via USB and let UltraPusher inject the required files automatically. Download, extract and run UltraPusher. Connect your iPhone to PC via USB cable and click 'Mobile Substrate' button to install it on your phone, reboot your phone when instructed. Once rebooted click 'Unlock' button to install ultrasn0w on your phone, reboot your phone TWICE when instructed. Your phone should now be unlocked and you are free to use any carrier SIM. can u pls help wat shuold i do?? hey man had my iphone jailbroken but not unlocked i tried your software to unlock after i've reboot my phone as following the manual it is stuck in safe mode plz help me i even tried to try the re-lock but doesn't do anything i tried to rstart and reboot my phone and also trying to restart my springboard plz cud u help me with this. Now, what you need, it's a jailbroken iPhone . Meaning the phone was jaibroken using redsn0w, snowbreeze or pwnagetool. If the phone was jailbroken with blackra1n or spirit, then you have to install afc2add via Cydia ... but you can't do that since you don't have wifi :-). heyyy thanq u so much kirasam .. it worked perfectly for me. Verified working on the new 4.2.1 JB using the IPAD Firmware. MUST USE THE 1.2 Yellow snow zip!!!! Thank for this, AWESOME WORK!!! thank you so much, worked very well! Thank you kirasam. Its worked for the poor built and inspection quality iPhone 3G (wifi is being funny all the time, not working at all). is it normal for the iPhone's 3 third reboot to be very long?? yea those it take long? I DISCOVERED IT DOES NOT WORK ON WINDOWS 7 (64) .Maybe it'll work on earlier versions. To avoid continuous booting, make sure you use the original sim network it was locked to and do not disconnect from pc. I think it has to retrieve some files form the zip during booting. though it says that it unlocked the phone which it didnt. i hv done as mentioned thru copying 2 files of ultrasn0w and mobilesubstrate to the cydia autoinstall directory. but now what happens is that my iphone accept only one sim connection i'e cellone. it is not accepting other sim connections like airtel, vodafone, docomo or idea. I did copy the file using iphone browser, but I am stuck on second restart! help! just see the apple logo forever! I jailbreak iphone 3gs 3.1.3 using spirit.There is no that file path (private/var/root/Media/Cydia/AutoInstal). Any solution? doesnt work...it gives the msgs even without device connected. worse yet wit my device in, it generates error "the procedure entry point CFCopyDescription could not be located in the dynamic link library qtmclient" but gives the above message boxes...thats really weird! It works like a charm. Thanks again..
how should i install phone substrate & ultrasn0w on my phone??? ultrapusher work to baseband 06.15? Thanks my iphone is unlocked. Will it remove IMEI number? I have the same problem, please someone help! The Public Traffic of the file's owner is exhausted. This is an old post and should not work with iPhone 6s.